Director/Screenplay – M. Night Shyamalan, Based on the TV Series Avatar: The Last Airbender Created by Michael Dante DiMartino & Bryan Konietzko, Producers – Frank Marshall & Sam Mercer, Photography – Andrew Lesnie, Music – James Newton Howard, Visual Effects Supervisor – Pablo Helman, Visual Effects – Dive, Industrial Light and Magic (Animation Supervisor – Tim Harrington), Philm, Inc. & Svengali Visual Effects, Special Effects Supervisor – Steve Cremin, Production Design – Philip Messina. Production Company – Paramount/Nickelodeon Movies/Blinding Edge Pictures/The Kennedy-Marshall Company. The world is divided into four nations – the lands of Fire, Air, Earth and Water. In each nation, some people have the ability to manipulate or bend their native element. Sokka and Katara are a brother and sister of the Water Nation in the far south, she having some waterbending power. While out hunting, they are surprised by a giant sphere of energy that emerges from the ice and opens to reveal a young boy and a giant animal in suspended animation. The boy, named Aang, recovers back at their village, where he learns that he has been in suspended animation for a hundred years. The village is then invaded by Zuko, the prince heir of the Fire Nation, who has been sent into exile by his father. Capturing Aang, they determine that he is the Avatar, the legendary Airbender who has the ability to manipulate all four elements. Sokka and Katara help rescue Aang. He sets out to find his home, only to learn that while he has been in suspended animation, the Fire Nation has slaughtered all of the Air People, hoping to kill the Avatar. They set out on a quest to the north so that Aang can learn to master his waterbending powers. They are pursued by Zuko who wants to earn back his rightful title by capturing the Avatar, as well as the armies of the Fire Nation who are determined to kill Aang. 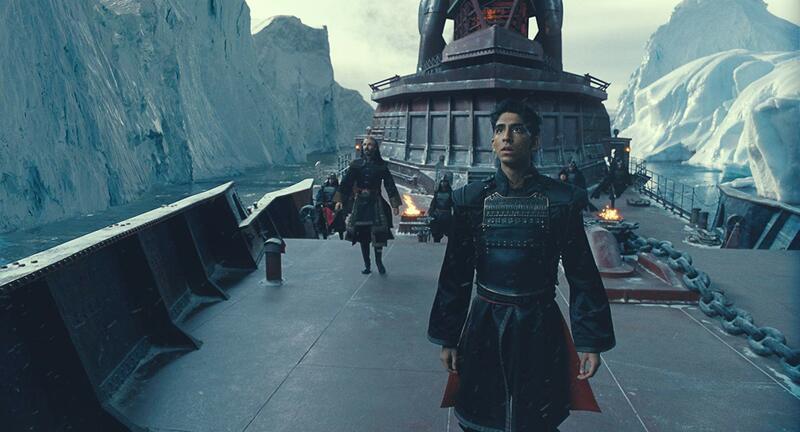 The Last Airbender was the ninth film from M. Night Shyamalan. The Indian-born, US resident Shyamalan first became noticed with his third film, the runaway hit of The Sixth Sense (1999). The Sixth Sense‘s twist ending became a talking point and made the film an instant classic, not to mention paved the way for a genre of science-fiction and horror films premised on sudden conceptual reversals or revelations about the nature of reality. Shyamalan became trapped by that for a time with studio marketers trying to push subsequent works such as Unbreakable (2000), Signs (2002) and The Village (2004) into a similar model that was based around building up an amazing mystery as to even what the film was about, before arriving at a big aha unveiling. Soon M. Night Shyamalan’s films were greeted by a growing audience dissatisfaction with in particular his soggy twist endings and woolly-headed mysticism. Shyamalan subsequently attempted to take control over the marketing, only to see works like Lady in the Water (2006) and The Happening (2008) greeted with universal derision. Before The Last Airbender opened, people were slighting it based solely on Shyamalan’s track record. The Shyamalan produced The Night Chronicles 1: Devil (2010) opened two months later and received a mediocre reception coming on the back of The Last Airbender – I had the experience of being in a theatre where the trailer for Devil screened and hearing a loud boo went up when the Shyamalan name appeared. Aside from his script for Stuart Little (1999), The Last Airbender is the first of M. Night Shyamalan’s scripts based on prior source material in which he did not come up with the idea from scratch. In this case, the film is based on the animated tv series Avatar: The Last Airbender (2005-8) that aired on the US Nickelodeon Channel. Though created by US animators, the series was drawn in anime style and incorporated ideas from Eastern martial and spiritual traditions. It crafted an epic-sized story about the war between the elements and the rise of the Avatar child into his powers. The series won a number of awards during its run. The film adapts the first season of the tv series, clearly leaving the other two seasons, Book Two: Earth and Book Three: Fire, for proposed sequels, although with The Last Airbender‘s poor critical reception, it seems unlikely that we will see these. The full title of the series Avatar: The Last Airbender has been dropped no doubt to avoid confusion with James Cameron’s Avatar (2009). The Last Airbender opened to a largely negative reception. I went to see it unenthused by the advance trailer and not expecting anything great. Not to mention, I was majorly turned off by learning that it had been quickly repackaged in post-production as yet another film trying to exploit the 3D fad following the massive hit of Avatar, even though it was not originally shot in 3D – see the other likes of Alice in Wonderland (2010), The Chronicles of Narnia: The Voyage of the Dawn Treader (2010), Clash of the Titans (2010), Gulliver’s Travels (2010), My Soul to Take (2010) and The Green Hornet (2011). It was with modest surprise that I ended up enjoying The Last Airbender and finding it a halfway reasonable fantasy film. I also watched The Last Airbender flat instead of in 3D and I except a large part of the negative audience reception was due to the reported shoddiness of the post-production 3D transfer. You only need to compare it to Dragonball: Evolution (2009), another live-action film that condensed a popular animated tv series into a single film with disastrous results to see the difference between the two and how badly it could have emerged. For all the negative points you can cite about M. Night Shyamalan, and there are many – his lofty pretensions and sense of self-importance, his obsession with mysticism and predestination, the lameness of some of his shaggy dog endings – what you cannot deny is that he is one of the few filmmakers who has original ideas rather than constantly recycles other people’s material. He treats Avatar: The Last Airbender as springboard to create a uniquely different fantasy film. As a result, The Last Airbender becomes one of the few originally designed worlds in the post-Lord of the Rings glut of fantasy films. It feels like a Western sword and sorcery film that has instead been made by Asian filmmakers. Where J.R.R. Tolkien draws on Teutonic and Scandinavian mythology for the Lord of the Rings, The Last Airbender incorporates Eastern traditions – martial disciplines, Buddhism, reincarnation – and borrows from the various cultures in its costuming and architecture. It makes for something fascinatingly original. 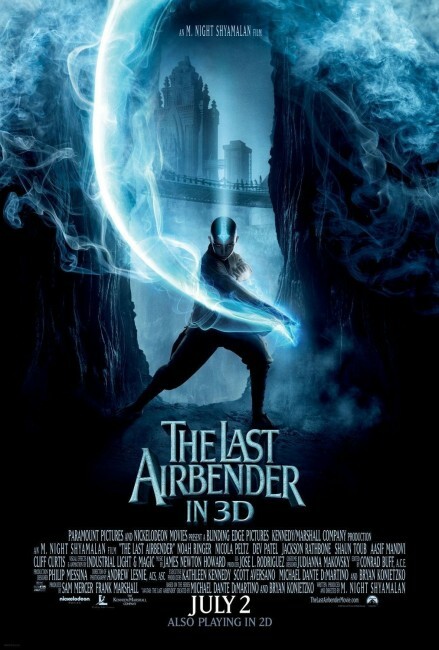 There was some controversy before The Last Airbender opened of it having ‘whitewashed’ the original tv series – the term given to the practice of filling what are originally ethnic roles with Caucasian actors – an accusation also made of Prince of Persia: The Sands of Time (2010), another recent big-budget fantasy that flopped at the box-office. Where Avatar: The Last Airbender had its central triptych of heroes as distinctly Asian and dark-skinned, the film recasts them with standard American actors. Say what you like about this – whether it is an inherent box-office bias that feels it has to kowtow to white audiences in the belief that they would not accept a film with an ethnic hero or that it is one of the necessities of making a work more commercial – you cannot decry what M. Night Shyamalan has done elsewhere in designing his world down ethnic lines – the Fire People are largely cast with Indians, the Earth and Air People are Asian, while the Water People seem to be Caucasian with a culture that is a mix of Inuit and Scandinavian. Whatever else you want to say about The Last Airbender, it takes place in a richly complex and superbly well-designed world. M. Night Shyamalan has a luxurious eye for the pageantry of the sets and costumery. His design people have great delight in coming up with exotic creations – the Fire People’s giant menacing black iron warships, powered by coal and spewing great clouds of soot into the air; Aang and his nifty miniature handheld hang glider; the amazing array of palaces, ice cities and ruined temples. It is a world that Shyamalan creates in a way that feels like it has genuine texture, depth and culture. The Last Airbender received a good many negative comments about the story being dense, incomprehensible, mystical twaddle, while it was ironically accused of being both too faithful to and not faithful enough to the original tv series. I have never seen the tv series but I can say I did not have any particular difficulty following what was happening. It certainly seems no different to and no more complicated than any other screen fantasy work like The Lord of the Rings, The Golden Compass (2007) and the Harry Potter films both in condensing a larger original text for the screen and dealing with a wide canvas of characters and intersecting plots. The main negative point is that the story remains unresolved – the film has only adapted the first season of the tv series and left the story open-ended, ending as Zuko’s sister is sent into action and with Aang still having to visit the Earth People and Fire People to receive training in bending those elements. With The Last Airbender‘s less than enthusiastic reception, it seems unlikely that we will ever see the other two chapters, meaning that it joins the growing heap of unresolved fantasy series, along with the likes of Eragon (2006), The Golden Compass, The Seeker: The Dark is Rising (2007), Inkheart (2008) and Cirque du Freak: The Vampire’s Assistant (2009), all works that tried to start the next big fantasy franchise off but never got beyond the first chapter. The mythic arc is there – even if the characters never fully inflate it – and M. Night Shyamalan does a reasonable job of making the martial arts and various element bendings work with some visual brio throughout. The film rises to a particularly imaginative climax with Aang going into combat in one great tracking shot that follows him as he dances in slow-motion leaps and twirls, causing waterspouts to down opponents or form into icicles that trap others, holes in the ice to appear and swallow soldiers up, before the big climactic moment where he wields the ocean into a massive wave suspended in mid-air over the Fire People warships. It’s a great climactic scene, even if the essential idea has been borrowed from the similar climax of the extended version of The Abyss (1989). I liked The Last Airbender, even if it will never attain this site’s Top 10 list for the year. It’s not perfect. The main problem is that it has great sweep but often remains inert. The story wheels epical events around just like The Lord of the Rings films but it is only during the last act that it fully starts to soar. The film is not helped by some of its flat actors. In particular, both Nicola Peltz and Jackson Rathbone leave almost no distinction on their characters. Noah Ringer has undeniable charisma as Aang and plays well, even if some of the dialogue grates in his naturally lively delivery. The best performance comes from Dev Patel of Slumdog Millionaire (2008) fame. Zuko is a fairly one-dimensional role but Patel broods and glowers his way through it well. He also receives decent support from Shaun Toub and Aasif Mandvi. M. Night Shyamalan next went onto make the planetary adventure After Earth (2013), the Found Footage horror comedy The Visit (2015) and the split personality film Split (2017) and its sequel Glass (2019). (Nominee for Best Production Design at this site’s Best of 2010 Awards).